REBS website – Bonsai club founded in 1981, in Santa Rosa, CA. Dedicated to learning and promoting the living art of bonsai. Visit our website to discover more about the club. 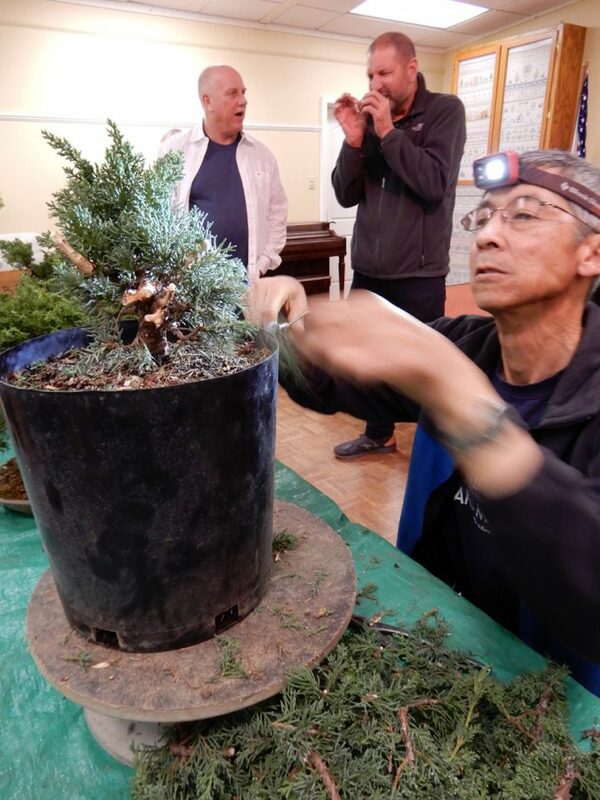 On March 26, 2019, at the Luther Burbank Art and Garden Center, Santa Rosa, California, Randall Lee conducted a demonstration working with Shimpaku juniper. 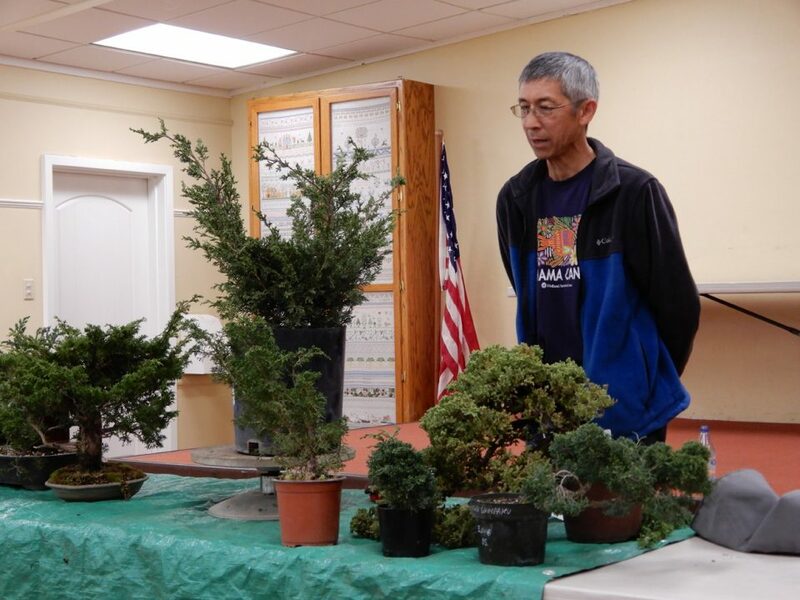 Randall began his demonstration by identifying the various types of junipers used for bonsai. These included Shimpaku, Kishu Shimpaku, Itoigawa Shimpaku, San Jose, Prostrata, Procumbens nana, Buffalo. Sources for purchasing these junipers are bonsai growers and vendors, local nurseries and Home Depot. Randall described the soil mix he uses as 1/3 Akadama, 1/3 pumice and 1/3 lava rock. He will use a wetter soil mix, 40% pumice and 60% Akadama, as well. He said organic fertilizer for slower growth. However, since he is using young plants and may want to have more growth, he will use chemical fertilizers, such as Apex, Power Gro, Romeo water soluble fertilizer. He does not use fertilizer cakes and tea bags filled with fertilizer due to rodents being attracted to them. Randall began working with the Shimpaku demo tree by examining and evaluating the inside of the plant. He could observe many small branches at or near the base of the plant. Some larger branches appeared towards the top portion of the plant. He cut and removed the large, unwanted branches first. His design would be a small bonsai or Shohin classification. He paid close attention to the base of the plant and followed the trunk line from the base of the plant to the apex. He selected a potential front view of the bonsai. In removing the unwanted branches, he created jins or deadwood features in the bonsai design. Upon removing the largest branches, the Shimpaku juniper began to take shape, thicker at the base and thin towards the top or apex. Randall emphasized cutting back on the foliage. He removed more than one third of the plant’s foliage at this point. By cutting back on the foliage, he would have the plant back bud on the interior. He said this was important since the Shohin style or small bonsai design required small branches close in to the trunk. Randall began to place aluminum wire on the small branches. The wire was used to create movement and interest in the setting of the branches. Some branches were too soft and young to wire at this time, but would need wiring when they harden off more. He described the selection of branches to remain on the plant must be in proportion to the trunk of the bonsai. Care for the Shimpaku juniper post demonstration included keeping it out of the direct sun for few weeks. “Let it grow and relax” according to Randall. He removed a lot of foliage and the plant needed to rest for a while. He would not fertilize for four to six weeks. Upon completion of the demonstration, a raffle for the newly created bonsai was held. 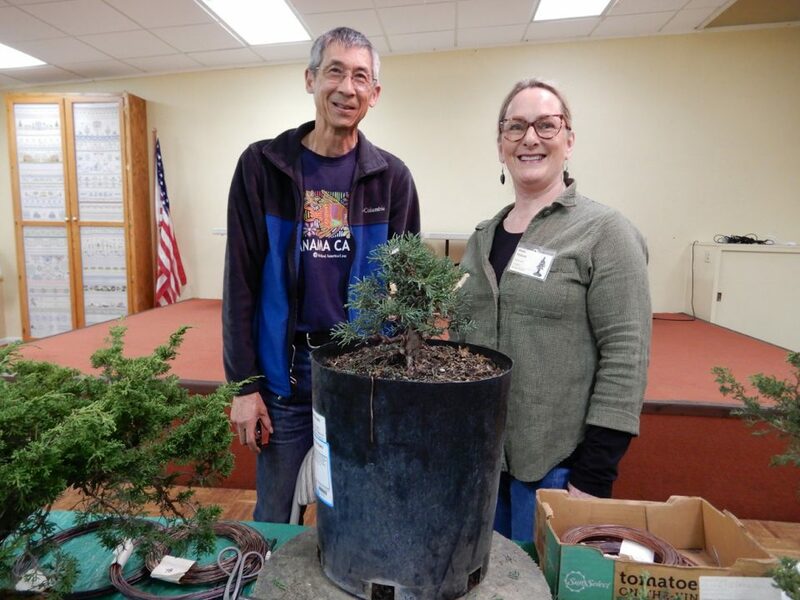 REBS member Diane Matzen purchased the winning raffle ticket for the Shimpaku juniper. 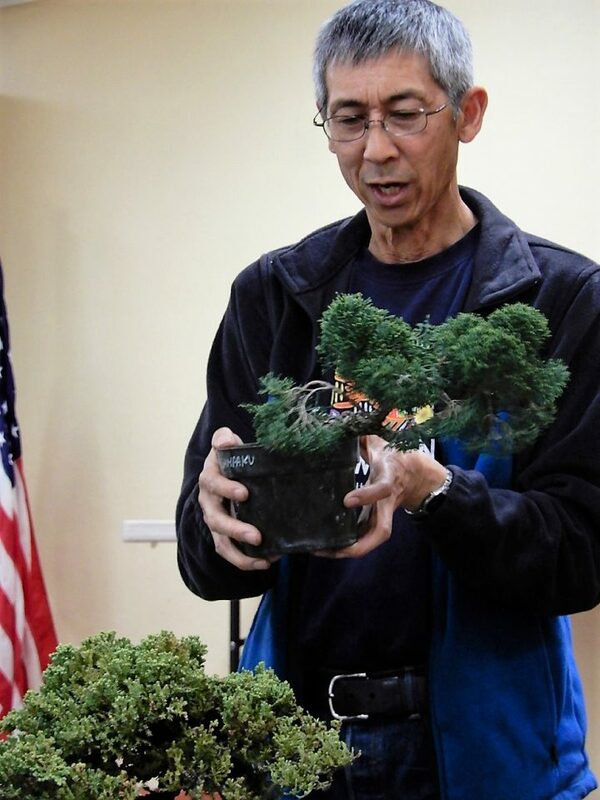 During the Sonoma County Home & Garden Show, Sonoma Fairgrounds, Santa Rosa, March 15, 16 and 17, 2019, Art Kopecky led a group of volunteer REBS members in setting up and displaying bonsai. Club information brochures and the annual REBS August bonsai show postcards were handed out to promote club membership and attendance at the annual show. On February 26, 2019, Eric Schrader returned to conduct a demonstration for the REBS meeting. Eric worked on a Monterey Cypress, approximately 12 years old, grown from seed. Eric said he collected the Monterey Cypress seeds from the Presidio of San Francisco. He planted a number of the seeds. The Monterey Cypress (Cupressus macrocarpa) were planted by the US Army in the 1880s. The Monterey Cypress is a very vigorous grower and quick to develop into a bonsai. The tree experiences year-round growth. The demonstration tree was planted for awhile in the ground to speed its growth. Eric brought in another Monterey Cypress as a potted bonsai. It was a smaller version of the demonstration tree. In order to maintain its shape and compact foliage, Eric will pinch the terminal tips of any runners. Eric described the natural growth pattern of the Monterey Cypress branches as growing upward and outwards from the trunk. He demonstrated wiring the branches upward and outward. The ends of the branches were laid out flat to form the usual pads. Eric identified a front view and marked it with two pieces of chopsticks. The front view was selected based on the movement of the trunk. There was one side of the trunk without branches which did not serve well for the front. He then proceeded to remove surface soil to reveal some of the flair in the trunk base. Some surface roots were removed as well. Eric started to wire the top branches. He did this versus starting to wire from the bottom as normal because he intended to wire the branches upward and outward. Eric said the Monterey Cypress is vulnerable to scale and spider mites and so one must keep an eye out for these pests and treat accordingly. He also said the Monterey Cypress does not take heat (100-degree F and above) very well. San Francisco’s weather is normally ideal for the Monterey Cypress. However, the weather can spike upwards in the summer. Eric cut with a small saw the trunk more than 50%. The length of the trunk was grown to enlarge the trunk base. After growing the size desired for the trunk base, the length was no longer needed. This is referred to eliminating the sacrifice branch or limb. Eric discussed creating jin and shari (deadwood features) to demonstrate age and mask the cut wounds. When questioned about the best time to work on Monterey Cypress, Eric replied he prefers July, August and September time frames. Upon completion of the demonstration, Ivan Lukrich won the Monterey Cypress. On January 22, 2019, Jay McDonald was the guest demonstrator for the monthly REBS meeting. Jay has been interested in bonsai for almost 20 years. He studied under the Sensei Kathy Shaner and various other bonsai masters. Jay’s personal collection of bonsai is remarkable at about 25 bonsai. 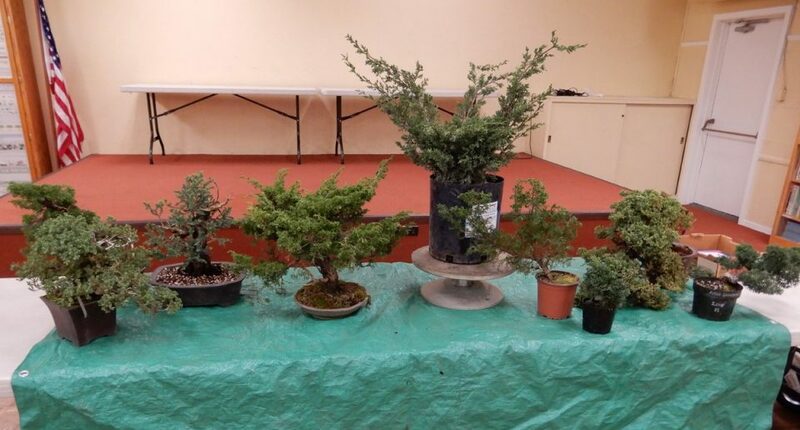 He brought for show and tell several of his mature bonsai, Ume, Olive and Japanese Larch (see images). Jay’s demonstration tree was a Procumbens nana juniper, about 30 years old. 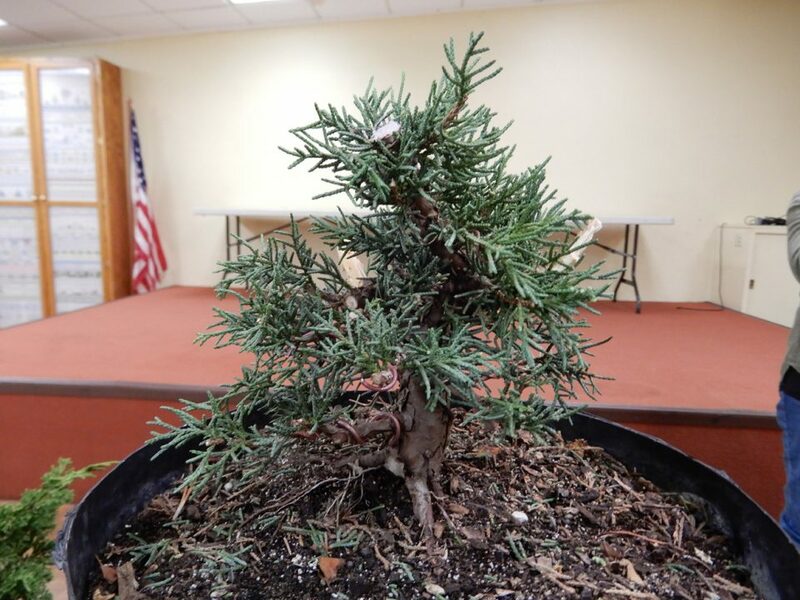 The juniper was purchased from Bob Shimon of Mendocino Coast Bonsai. The juniper was grown in southern California for bonsai and displayed a lot movement in the trunk. Jay worked on the tree before bringing it to the demonstration. He cleaned up the foliage and removed any large branches that were no in proportion to the tree and trunk. He also did some pre-wiring of the demonstration tree. Jay emphasized proportion of branches to diameter of the trunk and other branches. You can’t have larger branches near the top with smaller branches below them. The larger branches would be out of proportion and need to be removed by cutting them off or by cutting them short and making jins (deadwood) out of them. Deadwood on junipers is essential. Jay pointed out some branches he stripped the bark off of and made in to jins. In order to create age and interesting characteristics in junipers, Jay said deadwood features are important. Wiring the whole tree. Jay said bonsai is wiring. Wiring the whole tree is also important to creating bonsai with age and movement of the branches. Jay made it clear that he desired the wiring of the whole tree, including the small twig like branches. Wiring is controlling the movement and flow of bonsai design. He highlighted the purpose of wiring as creating movement, taper and interest. Fertilizer. 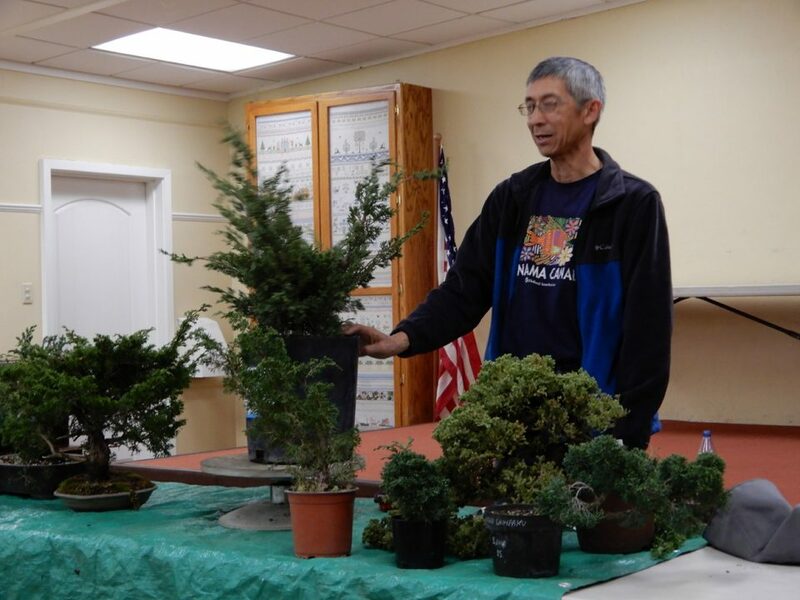 Jay believes in fertilizing his bonsai and starting early around the end of January. He has used an assortment of fertilizer, including organic and chemical. He will used Miracle Gro on his bonsai to give them a boost in growth when trying to build his bonsai. He then will use organic fertilizer when his bonsai are more mature and slower growth is desirable. 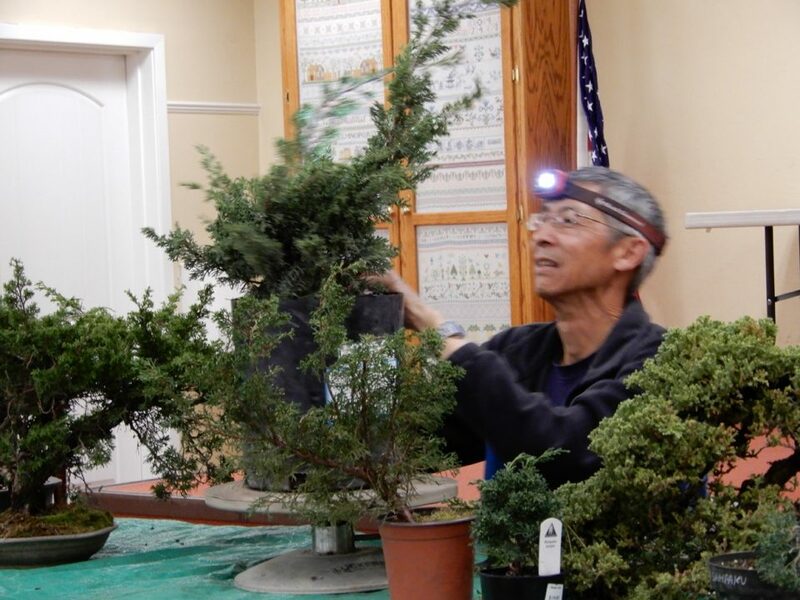 In finishing the demonstration bonsai, Jay applied a generous amount of moss to the top soil. Jay said moss is the proper manner in which to display bonsai. The moss can be removed when not displaying the bonsai. 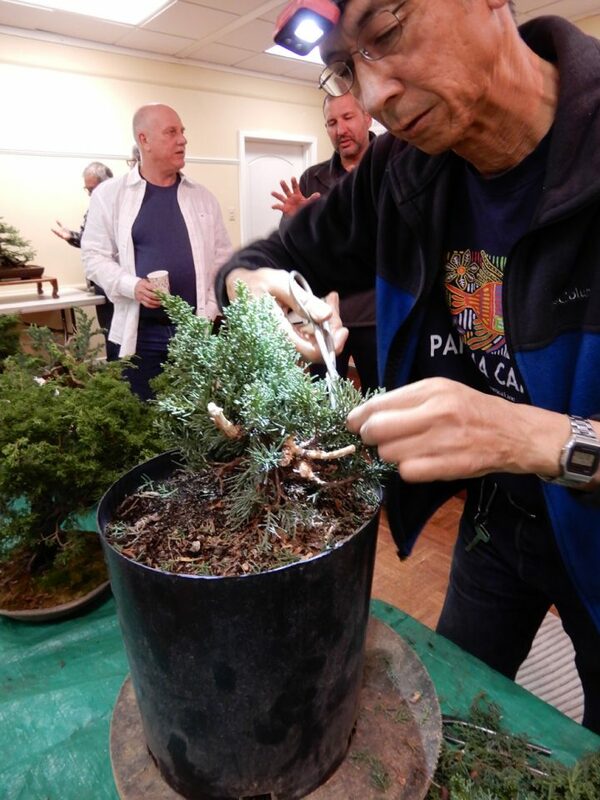 Upon completion of demonstration, a raffle of the Procumbens nana juniper was held and club member Paul Wycoff won the bonsai.